Congressman Keith Ellison (DFL-Minneapolis) is wrapping up his first term representing Minnesota’s Fifth Congressional District. I sat down with him in his office to check in about some of this session’s highlights. What was your position on the attempt to strip transgender protection from the Employment Non-Discrimination Act (ENDA)? Transgender people are some of the most vulnerable people in our society. I have good friends who are transgender, and they’re some of the most capable people that I’ve ever had the pleasure to work with. It’s just wrong to exclude them. Yet, that’s the group that the far right singled out to try to break up the coalition on ENDA. Unfortunately, it had some success. At least in the Democratic caucus, everybody was for ENDA, but if we couldn’t get the votes that we needed, then what? I won’t rest till transgender protections are included. I think of myself as an activist politician. But at the end of the day, my job is not simply to raise consciousness. We have to do the best we can with as many people as we can. What have you done to address HIV/AIDS? I recently was part of a documentary in which I actually took an HIV test on camera—to try to get other people to get tested. I think for a lot of people aren’t sure if they want to get tested, but if they see a Congressman got tested, they might want to. African American AIDS Awareness month was February. I did an opinion piece and a radio address on economics and HIV/AIDS for the Congressional Black Caucus. I also work closely with a group called Soul Essence, which is an African American GLBT group. I definitely support increasing outreach funding for HIV testing, both among African Americans and Africa- born people, but also all Americans. What have you done to address the military’s Don’t Ask, Don’t Tell (DADT) policy banning military service for out lesbians and gays? How does addressing DADT intersect with your commitment to peace issues? Being propeace doesn’t mean I’m antimilitary. I just think that the military should only be used to protect the lives of the American people, or to protect the lives of vulnerable people, like the Darfurians. It could have been the Rwandans. Of course, we know it’s used for a whole lot more than that, and I think that should be stopped. But politicians make decisions to go to war, not soldiers. Defending your country, defending the lives of your fellow Americans and other vulnerable people—that’s noble. How could you tell someone that they cannot serve their nation out of a patriotic love of country, because you don’t happen to like their sexual orientation? It’s an abominable, arbitrary reason to exclude somebody. You have a staff person dedicated to GLBT community issues. Is this common among members of Congress? I don’t know how common it is. We didn’t ask what everybody else was doing. We asked what our community needed, and did that. It’s helpful to have a better understanding of the GLBT community. If you’re not GLBT, how would you know the contours of the community unless you committed your resources to learning? Obviously, the GLBT community is very diverse. There are various groups that are known more to represent one faction or another. All are good, but all are not identical. When I was in the Minnesota House, there was what could only be described as an antigay Klan rally about the whole sanctity of marriage thing. And then, there was a massive promarriage counterprotest day on the hill. But as I looked through the crowd, I noticed a very low number of people of color. You describe yourself as an activist politician. What influences you in working for social justice? We all start with the window on the world which is available to us. I think being born black, I interacted with the world and the world interacted with me in a particular way. Whenever you’re confronted with exclusion, you can either get bitter or get better, and having a victim-based identity is based on fear. But I don’t think you have to come up out of a circumstance of discrimination to embrace compassion. In this case, compassion is not feeling sorry for everyone, but feeling very deep solidarity with everyone. We are united, not just in the fact [that] in 150 years, we’re all ashes and dust, but that in the present moment, we all have so much that we all need. All people need not just food, clothing, and shelter, but peace, acceptance, and approval. I’ve figured out where my faith is to a certain extent. My faith helps me understand what I think my soul already knows. My religious orientation is a signpost, but it’s not the destination. For me, Islam is like the sign that says “Chicago: 247 Miles.” When you arrive at that destination, there is no religious label that could ever describe it. You’ve spoken at past GLBT community events about the importance of simultaneously dismantling racism, sexism, classism, and homophobia. Why is that important? Our goals are peace here and in the world, prosperity for all people, living in harmony with creation, and respecting human dignity for everybody. All four of those collapse into the politics of generosity for me. Now, what would keep us from that? Individual and collective egotism. That would manifest itself in a group saying, “We’re better,” or a group saying, “We’ve been scorned,” and engaging in adversarial, grievance-oriented politics. Not that you shouldn’t raise a grievance—because we need to hear them—but raise it in a way that benefits everybody. So, it’s important to attack all of those systems of oppression, because all of them represent false barriers to human solidarity, and that’s what we need to have well-being for all human beings and the Earth. Proud to have Keith as my congressman! Nicely done, David. 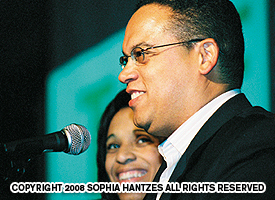 Keith Ellison has proven himself to be a very significant ally to our GLBT communities. I believe your interview conveys that very important fact to his constituents. as congressman Keith Ellison, i’m a progresive Muslim, but first i’m a progresive human being and i know what compassion is all about being a world traveler seeing all of those Aid cases in South Africa and west africa and meeting the congressman in UAE we as people of the world have to start showing compassion to all of the needed of the world and also to America, how little do we forget of the past history of America and we do not want to put on the shackles of ignorance to our people and the millions of American that need our support. We take it for granted that being from an urban area we should have a progressive congressperson truly representing us and not just giving lip service to our needs. We are so lucky to have Keith Ellison representing our district in Washington.